In this video I offer some clues about what the Pole-Shift will look like, but keep in mind, everybody’s experience will be depend on where you live. There are some identical actions we all will have to take: Stay out of the wind to shield yourself from hailing rock and debris; Provide your cover with more-than-ample water drainage; Establish your bunker on stable high ground; All bunker’s should have 2 exits; Your bunker should be above any lakes, rivers or damns; Your location would best be above the new shoreline due to the Pole-Melt within 1.5 years of the Pole-Shift, otherwise you will just have to relocate after the Pole-Shift. Your location should be at least 100 miles away from any volcanoes less than 10,000 years old; Whatever is North of you before the Pole-Shift, will be West of you in the immediate After-Time (after the Pole-Shift), don’t let that be a volcano unless you are sure that the prevailing winds in your area will carry the ash away from your location (this is calculate-able :check out my newsletter Issue #2 below). Where protective clothing and ear & eye protection. I also discuss what stable and unstable ground looks like, fairly obvious to the experienced, but not-so-obvious to some people, so could save lives. The next in the video sequence will be moving on to bunker styles. I discuss what I think is a good bunker design and how others could be death-traps, in my opinion. Finally I unexpectedly decided to add my discourse on Waking Dreams, which in my opinion, is the most important subtlety, and I think, is a unique offering in the world today of all the discussions of readiness for the Pole-Shift. I’ve added this discourse at the bottom of this post. Keep in mind, this was written as a post on my Facebook group, so is not quite written to the same level as I usually do. 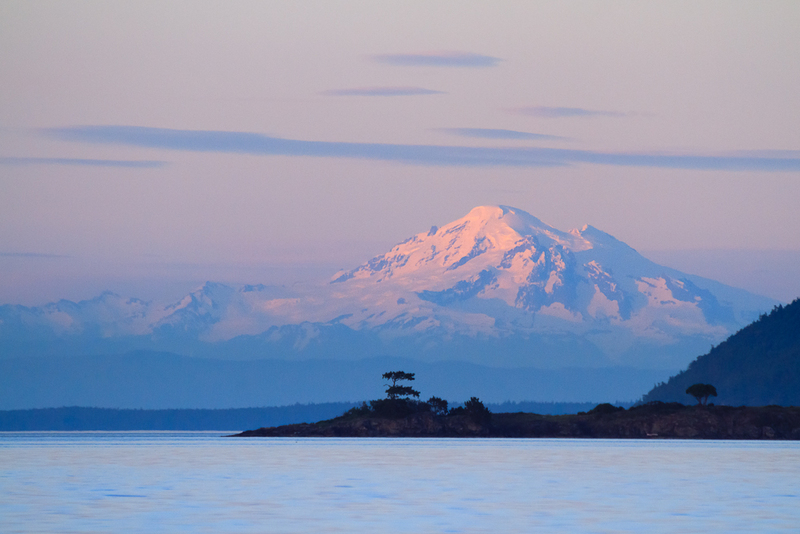 Sunset on Mount Baker, Washington photographed from Sidney, British Columbia. This topic is so important, it is side-by-side with my Planet X work and any of the other spiritual work I do because it is a direct communication with your Over-Soul. The reason why I see it this way will explained within this post. Just to briefly mention, though, our Over-Soul, simply put, is our immediate soul-parent. We all have our frameworks that we place Life into, and although in my opinion, the following fits right into any one of them, yet some my disagree. Regardless, waking dreams are ubiquitous, and in fact, are referred to in all the ancient religious writings. As a cautionary, let me re-iterate that this group, although not anti-religious, is a non-religious group. This is to say that postings that are of a religious nature will be deleted. Allow me to also to say, that religious concepts do have a basis in truth at some point in the distant past, but discussions of those fine points are off-topic in this group. Now, I see a vast difference between “spiritual” and “religious” topics: the first is just science on a higher level (what I call “spirit-science”) and the religious are beliefs in historical preconceived concepts forwarded by others and these concepts have their own set of word meanings. The latter is probably the most divisive aspect to religious discussions, but I digress. Again, we do not discuss religious concepts/beliefs, because – #1, they have no place in readiness for the Pole-Shift and the After-Time for the general public, the secular, and by default, also apply to religionists as well since the non-secular also need the same information that we try to present in this group. #2- Religious topics and discussions can never be concluded, and if so, usually with hard feelings between the participants. They also take up space I would rather be used for important member questions, Planet X news-worthy items and other on-topic Planet X, Pole-Shift survival and After-Time preparations & ideas. I have been working with waking dreams for over 20 years. The term: “Waking Dreams” comes from Eckankar, as I am an “Eckist”, which is a religion! However, I will not be discussing Eckankar in this post or any future posts in our group except to draw on the all-important subject of waking dreams. Waking dreams are not concepts, they are a reality. In any case, one cannot find a resource anywhere that defines the waking dream per say, this is because it is an intuitive process, and thereby is just not definable. Not definable, but, one’s experiences are describable. In these End Times, I believe it is critical that people learn to see the waking dream for obvious reasons to the Planet X aware. On that point, I am sure that all will agree IF indeed the waking dream (WD) can do as I describe! A description is as follows: A WD will tell you anything you need to know to live a happy healthy Life. The WD is always based in Love and for those who think they can use it for personal gain will be disappointed, however, and this is a big however, the latter does not mean you cannot prosper, just that you cannot use WD for strictly your own ego-desires – unless – your ego is aligned with your heart. REGARDLESS, even for the lowest of low, waking dreams abound about them! This is a hint about Life supporting it’s citizens, full stop. The Waking Dream is a 24 hour process and is directly related to the SLEEP dream. Now many people I’ve found do not remember their sleeping dreams, so, the waking dream then is even more important to them because, once learned how to recognize them, you do an end-run around the lack of memory of the sleep dream. So, it’s doesn’t matter if you are awake or asleep, it’s the same hand at work. Still, what I find, is that the WD is preferable to the sleep dream (depending on your dreaming abilities) because the WD message then has a direct path to your consciousness, your awareness, your ego-consciousness, so you immediately benefit. First: The waking dream uses ALL human experience, both inner & outer, to transmit the truth, the fact, the message, the reassurance and/or the answers we seek. Second: the WD does not wait for the receiver to be ready, it can happen at any time, anywhere and anyhow, ………….it is constantly broadcasting what we need to know. Third: It is harshly up the the individual to see and to interpret. Yet, this leads to one of the next conditions that you can ASK for a WD. Therefore if you want you can ask for a clarification on anything. Fourth: The WD uses who we are, what we believe and everything about us in order to pass the message. Fifth: The WD does not need a question from the receiver, it often will be about something you need to know. Period. Although, as I have said, you can ask for a WD on any subject. Waking dreams are not reliant on anything at all, which is to say, our expectations, neither seem to care, but are always available. READ THIS IF ANYTHING: expectations KILL our reception of the message. You do not LOOK for a WD, it comes to you in it’s own time. So. IF one is wondering what country to move to for the pole-shift, and while wondering and going about your business, the pizza guy comes to deliver your pizza with a blaring Australian accent, it maybe that moving to Australia could be the message. The message sticks out, oddly, and you go hmmmmmm…. This is one green flag the WD, across the whole of the subject, is true: the event, thought, word, road sign, visitation from a bird or an animal, THE LIST is infinite…., STICKS OUT. If you are considering collaborating with a person for a survival group and the first time you meet you see one of the following: he’s wearing a shirt that is of a colour you absolutely hate. OR, he has a “thumbs down” image emblazoned on the front of his shirt, OR, while speaking, the words for example: “no”, “not suitable”, or “look elsewhere” STICK out in the conversation. If you catch it, you got the message. If you are considering moving to a certain area for your safe-location, say for example: Timbuktu, and while mulling it over, you hear a song on “the radio”, Ipod or whatever, the T.V. from any source and you fall in love with the song, and later while Googling, discover that it is a Malian Song, I would call that a WD confirmation of a good place to move. I’M NOT ADVOCATING AFRICA!, it’s just an example. However, WD’s are perfectly tailored for the individual and if you are reading this and have thought about moving from south Africa to Mali, well….. If while wondering whether to buy a large quantity of canned food for the After-Time against the more expensive freeze-dried food, you happen to walk by a garbage can with a discarded tin can visible, one may consider that a confirmation to avoid canned food, MAY I say, it depends. If somehow, the empty tin can in the garbage is not distasteful to you AND perhaps you see it as a good place to FIND a tin can, then it could mean a confirmation for canned food. So it depends on the seer, NOT on the event/image or experience per say but how you respond to it. What garden tools to buy? Later that day you see the picture of pitchfork on a billboard, or you observe a streak of tar on the road that you swear looks like a pitchfork, etc. Are you worried about getting caught-out and not ready for the Pole-Shift? On your way to work you are following a bread truck and you notice these words: “All is well” with wonder bread smile emoticon The words: All is well sticks out. OR, your favourite song is playing on the radio while driving and over and over, the words are sung: “Don’t worry, be happy“, “Don’t worry, be happy“. Or maybe you wake up the next morning after tossing and turning about the pole-shift, you feel very peaceful without a care in the world, THAT experience may have been given to you to reassure you that all is well with your pole-shift timing. Now I’ll recount some of my waking dreams. -One day (about 2002), while feeling depressed sitting in a restaurant, wondering if I should just give up for the day and head home for a rest (it was 2 PM), I overheard the words from a conversation across the room: “Go home”. I kid you not. I went home. -Back in 1995, I was visiting a friend in Vancouver and was telling him about waking dreams and while talking to him, unbeknownst to me, he was asking for a particular waking dream to TEST what I was saying…. We were walking up a little hill on Granville Island, a park like setting, and while I was chatting away, at one point he gasped and fell silent. I asked what was wrong?, since it was like “he had seen a ghost”, collecting himself, he said he had asked for a waking dream which was: “If what I (Chris) was saying was true, then I want to see a blue baby carriage.” Of course, what had happened, while we were waking up the hill, we were just passed by a young woman coming down the hill pushing a blue baby carriage. I also see others’ waking dreams. My girl-friend was telling me how, while sitting on a bench admiring Mount Baker (Washington State) one summer evening, she heard a wedding party walk by behind her talking about of all things: “farting” This was funny, we laughed, but I immediately recognized that as a waking for her, why? Mount baker is a volcano, a young one, and will be erupting during the Pole-Shift. Of course my dear friend will hear NOT this information (PX, PS) from me, hence her waking dream! Still I told her that was her over-soul warning her of the impending Pole-Shift. Or download here at Dropbox. 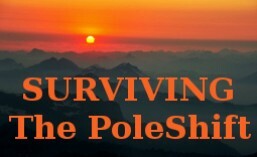 ← New video on Safe Locations for the Pole-Shift. If this occurs in a differentiated state of magnetism, how does a continent just slide across being a crust through salt water, is than an ice breaker your looking at and rips and tears the ocean floor that will heat the oceans, could there be a levitation of differentials in magnetism and it will use the sun as a generator, don’t want to be near that arc neither. Many unanswered questions in prepping and the signs coming. with earth-changes, that’s a PX cover-up vector.